Few items in a woman's closet as fraught as the handbag: status signifier, wardrobe extender, art object and... oh right, we use them to carry stuff. I am slightly obsessed with them, but in reverse: I wish to own very few, and need them to work with me. They're not arm candy; they're arm vitamins. No longer having a car means I'm hauling that bag for hours, so it has to be light, with a strap that gives support. Unable to tolerate a leather bag bigger than a grapefruit means my material of choice has changed, so I seek casual bags of lightweight materials. These are the bag equivalent of the young-adult novel: I didn't think I'd like them, but I've been pleasantly surprised. Assuming you already know the more familiar brands (Le SportSac, Baggelini, Mosey) I will place, in the Passage's windows, some lesser-known models. 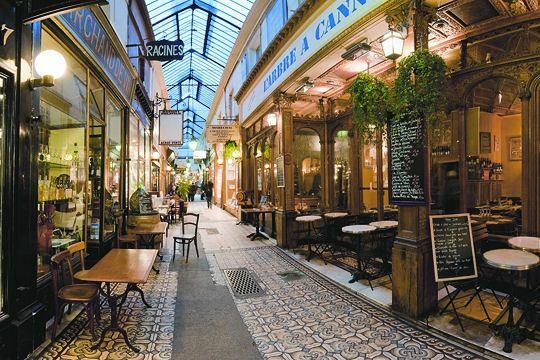 I have been in the Paris boutique many times and left empty-handed, overwhelmed by choice! Groom is another Paris treasure. You can now find their marvelous, hard-wearing bags online; spendy but worth it. The nylon models launder superbly. 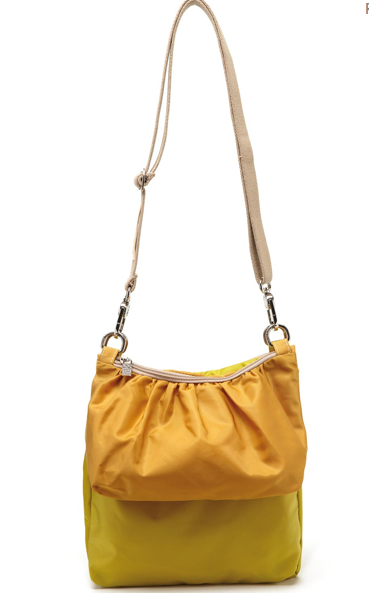 The Capuccio Medium sling sings in rich, gorgeous colours as well as neutrals; €109. You can also find selected Highway models on the MoMA Store's site. The canvas tote —if it doesn't get ratty—can attend most any casual gathering. Classically cool and dead cheap (though admittedly basic), this Montréal airport model from Monumental Love is an example of a beloved genre; price, $35. Québec textile artist Cynthia DM makes intensely-hued bags which she screens with nature motifs in a range of styles, a graceful, functional entry in the arty genre without being twee. 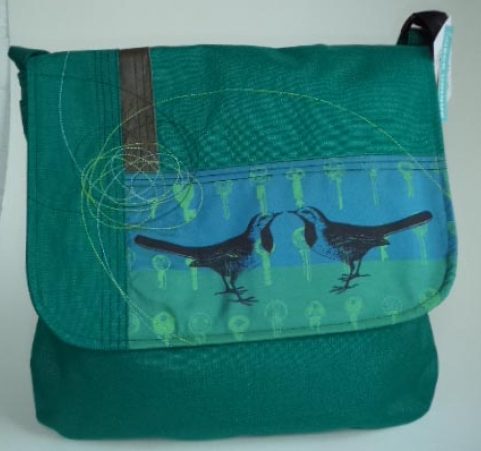 Shown, "bag with flap; teal with birds" price, $90. 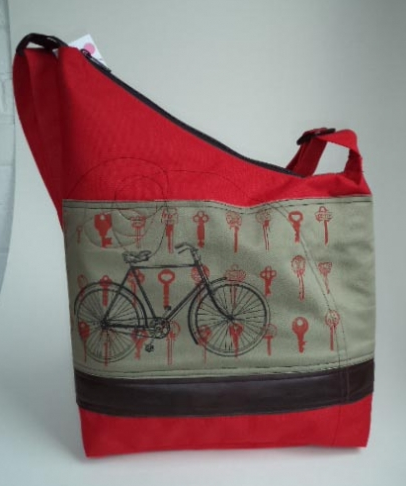 I'm charmed by her "triangle bag-bicycle" with a bike and antique keys, $90. For summer, an elegant linen tote from Paris-based firm Ikabags with various interior leather pocket and lining options. Price, about $120. My few remaining full-leather bags are like finicky vintage sports cars: I take them out for a ride only occasionally, for short trips. One of the bag styles shown, or a small change purse that drops into a pocket seems to be the new order, though I still pause before a luscious leather bag display... but only to look. but have lately found them to be too much weight for my shoulder and neck. My next bag will be this tote http://www.tumi.com/product/index.jsp?productId=21055926&prodFindSrc=search, Although I prefer hands-free, it may help with the physical aches and pains, we'll see. And of course I'll be madly googling your recommendations as well. BTW I saw part of a post about your earring reno that looked wonderful, it's not functioning now, just thought I'ld let you know. LauraH: The bags I have shown are smaller than that Tumi tote, which I would load up... a smaller size helps me cut down! The earring post was mistakenly published; it is not ready yet. I am waiting for the finished earring before I post it. I'm a fan of satchels with a crossbody strap. I can't wear bags on my shoulder anymore. But the crossbody strap HAS to be a certain width for comfort. I'll make a point to check out Karine Dupont and Groom when I'm in Paris. Pseu: I live vicariously through your leather bags! I too choose crossbody but sometimes they look horrible bisecting my top so I carry them on the shoulder if they are light. Have also been experimenting with a handbag (with handles), but cannot stand clutches- horrible for city life. No surprise, but I like to get things at thrifts or cheaply to test drive. I was lucky enough to find a Baggallini A La Carte bag at Goodwill. It has been perfect for me, since it can handle file folders (which I sometimes carry for work). I also have a rather squat Tumi hobo-type bag, which I am trying next. Love those Tumi totes LauraH provided links for. I too will check out your brands when I am in Paris. And speaking of totes and Paris. Mr FS and I were on a longish line for the half-priced pastries at a shop near our apartment. The French woman behind us was carrying a canvas "Metropolitan Museum of Art" tote as her purse and wearing a Farandole necklace and clic-clac cuff, both by Hermes. A very French combination. As we all left with our goodies, she came up to us and said in accented but perfect English (she had heard us chatting): "Such a great bargain, eh!" I got pulled into the bag love primarily, if I look back, through my participation in Blogging (obviously much too amenable to peer pressure!). I've amassed a small collection of bags that I love over the past few years, but really, I'm going to try to stick to the one mid-size, fairly lightweight M0851 (their lightest leather, which I find light enough to carry. We do have a car, but don't use it much in the city, and I'm often out for hours carrying my bag -- so the super efficient totes that I love with inner and outer pockets for everything just encourage a loading up that's not good for my neck and shoulders. Your options are delightful. But I'm reminding myself that I don't need more stuff. I'll look in the Passages window and enjoy, along with you, though, and thanks! Duchesse, you make so much sense. I did not bring a leather bag to Europe this year as my shoulders ache after long hours of toting. I bought the 3 pouch Karine Dupont in Paris last year and brought it with me. I also have a new Bagellini that I bought in the U.S. It does not look as casual as some of the others. Have you tried cork bags? They come in many styles, are very light and are waterproof plus are made from renewable resources. frugal: You are going to find the prices of those bags sky-high compared to thrifts! If you are thinking of 1154 Lill Studio, it is closing at this very moment, which is really too bad. mater: I was just in a M0851 yesterday buying son a new wallet. The bags are so light! Mme: I will carry a small leather bag for an evening accessory, or a big one onboard for a plane/train/car trip, but that's it! Deb: I had a Matt & Nat cork bag to test; found it not nearly as durable as luggage-weight nylon or microfiber. Great idea but not so much for our Montréal winters. I carry my Roots cross body bag most frequently these days but it is way too heavy and I need to lighten up the amount that I carry. Silly really because my neck is taking the brunt of the weight. I still lust after Chanel 2.55 bag but my bank account could not survive if I bought one and with Paris in the offing I could not justify the expense so I will continue to save and dream! The bicycle bag is rather fun! Still in leather here, but searching for an elusive drawstring bucket, now that I am back in a car in the suburbs. For summer, you might want to check out the LL Bean canvas tote bags--good price, sturdy and lots of colours. 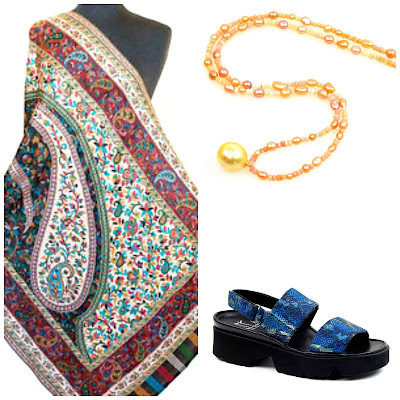 You can mix and match colours. There are different sizes, some zip and some open. The small is about 9x6x5--short or long over-the-shoulder handles. They have good online service, ship quickly and no charge to Canada at the moment. Another weight factor can be leather wallets and accessory pouches. I was surprised at how much lighter my cross body bag was without them so I'm going to look for something else, maybe in Japanese paper. I get what you're saying about loading up, this is something I find tricky as I'm often on the go from morning til evening. Do I take something to read on the subway? a snack? water? or buy as I go which gets expensive. Still working out what to carry as well as the bag itself. LPC: Yes, I know you are a leather lover. I am too, just- on you! Anon@1:45: Yes, the Bean tote is a good basic choice. They have long had free shipping to Canada, unlike other vendors who only offer it as a promo. 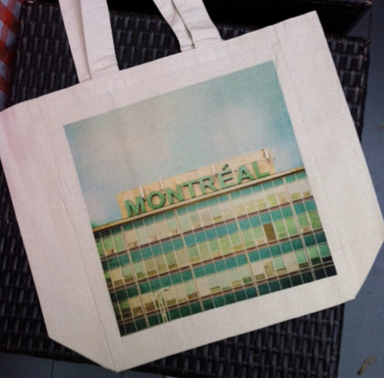 I especially enjoy the canvas with graphics like the "Montréal Airport" shown and have fun considering versions on sites like Etsy. Sometimes I only carry a coated-paper shopping bag! One is the Tote Bag. It’s nylon with leather handles and a snap-closure over the zipper. 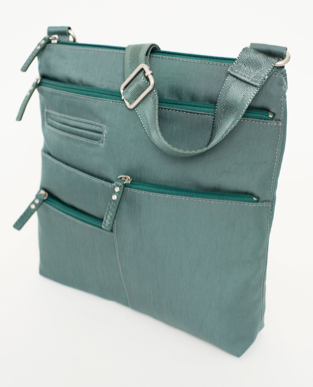 The handles are long enough to slip over my shoulders and the bag comes in a wide range of colours. It’s folded size is about 1 inch thick, 8x6 inches. My second is the Backpack. 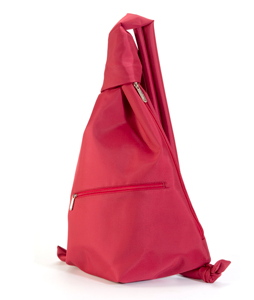 It’s also nylon, zippered with a leather snap closure over the zipper and has canvas adjustable shoulder straps. It’s folded size is about 1 inch thick by 6x6 inches. I’m looking at buying their ‘Hobo’. Also nylon, zippered, with one adjustable canvas strap, and foldable. I could probably wear it either as a shoulder bag or cross-body as the straps look long enough. 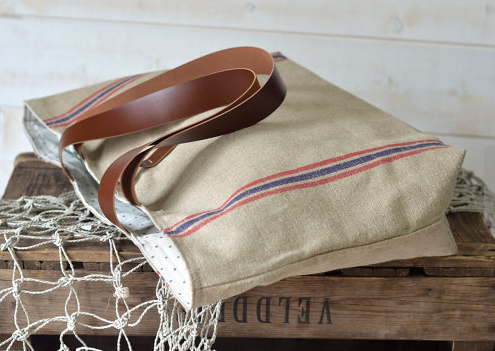 These are light-weight bags for carrying around all day but also for travelling with. All Le Pliage styles fold down into a thin size and slip easily between my clothes in my carry-on only luggage. I always have both bags with me during my day of sightseeing (they really do pack flat and hardly weigh anything) on my travels as I interchange them as the day goes on. I find my back/shoulders often get tired and having a change of purses (like a change of shoes) keeps me going all day. I’ve had both my bags for years now, use them very often and they look like new. And on my flight home I just might need the extra bag for the few things I bought on my trip! Marianne: The Pliage bags are well-known and loved- great for travel! I get some really great tips from your blog! 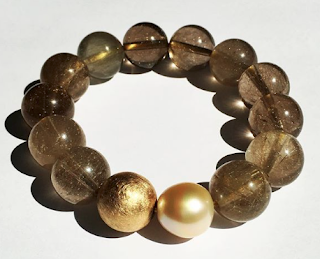 Love the Karine Dupont-had not heard of her or seen her products. Although I still travel by car to go shopping, I have developed terrible neck and back pain from all the years of large, heavy leather purses and other things slung over my shoulder while traveling and shopping. Just this past month I decided to go "nylon" to get some relief. So glad I did. My le pliage feels like a feather in comparison with the leather bags. I'm loving some of the Karine Dupont colors and styles. Thank you for sharing the information with all of us. Anon@1:03: I have nothing against the pliage, but like the idea of compartments and more colour options.I've noticed there are far more nylon or microfiber bags around at all price points. Women need other choices than heavy leather. Now that I'm teaching in the afternoons, I need a bag that I can get textbooks and folders into, as well as the rest of the stuff I can't live without. After thinking it over, I decided that my best option was a basic, basic, basic black nylon Muji tote. It's just the right size, has a wide adjustable strap, and an outside pocket for keys, kleenex, and lip balm. Since the inside is light grey, it's easy to find things. I still love leather bags, and carry them if I'm not teaching, but know better than to load and lug. Haven't worn my leather bags for a year now. Currently I take my Longchamps Hobo, although I find the bag itself a bit boring. I remember the long ago times when I used to wear Helmut Lang Clothes, most pieces had inside Pockets, like Men's wear, so I could go without any bag. Men do survive without bags and if wearing a coat I often leave the house with a small wallet, lipstick and house key. Mandarina Duck does nylon bags, but they are about charming as the Longchamps to me. Katrin Dupont is such a great find, I subscribed for their Newsletter, thank you, Duchesse. I chose small (about 20cm long) leather bags with a cross body strap for walking around town. There's just enough room for the essentials but it is a pain to carry an umbrella seperately or try and wedge one into a small bag(as you often need to in England!). I know it looks horrid to have the cross body strap bisecting my chest, but it's practical so I don't care. It looks fine over a coat and most of the year I am in some kind of coat. I love leather bags and live in a car-based culture so it is not so bad. But at the moment almost anything is too heavy but the lightest nylon. I am happy to see more attractive lightweight bags around.